I saw this gorgeous 12 x 12 paper with rose gold flower details in Kaisercraft the other day and I just needed to use it on this card! 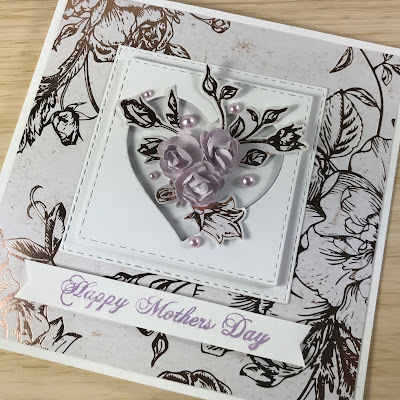 I used 5 x 5 inch piece for the background and fussy cut a few details for the centre of the card (I used a white 5 1/4 x 5 1/4 inch note card for the card base). I wanted to keep it simple and elegant by limiting the colours I used - rose gold, lilac and white. I die-cut two stitched squares (one a little larger than the other), and then I die-cut a heart from the smaller square. I wanted the heart to be subtle compared to the other pieces in the centre, so I kept the squares white-on-white. I adhered the smaller square to the centre of the larger square using some foam tape to add some dimension. Along with the fussy cut rose gold details I added some paper blooms and pearls to the centre of the heart. I stamped the sentiment onto some white cardstock using a pigment ink that was similar in colour to the pearls and paper blooms. Then I adhered the sentiment to the card using foam tape so it would stand out a little more. Just because mother's day happens once a year doesn't mean we should limit our appreciation for our mum's to a single day. Always let her know that you appreciate and love her. Of course getting her presents and giving her a handmade card doesn't hurt!